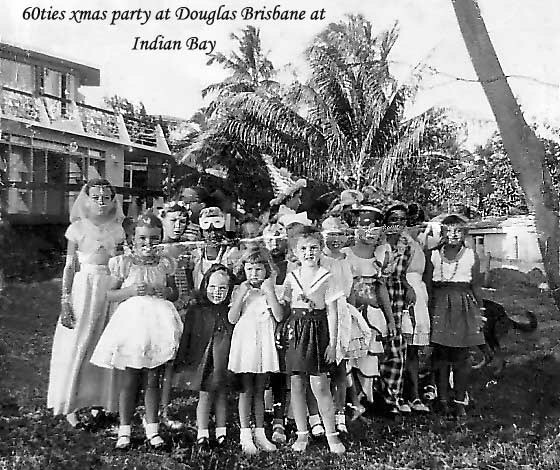 This picture was taken at Douglas Brisbane home in Indian Bay - It would be interesting to see how many faces we could put names to. next to Carol DON'T KNOW ? ? next DON'T KNOW ? ? next Kay, Laura,Girl with sailor top DON'T KNOW ? to her right Jennifer Brisbane , Dinana Taylor, Cecile , girl with her head turned right don't know then last Nicky Allen. Cannot put any names to the ones in the front, or the tall girl with the cone hat to he back. Can any one put a year to this photo, must be early 60's.